Choose a handbag corsage when the occasion for flowers calls, but the attire you are wearing doesn't support a traditional corsage. A corsage is a small bouquet of flowers worn by a woman for a formal occasion. Traditionally, a corsage is pinned to the clothing or may be worn around the wrist. Choosing a corsage over a bouquet allows the hands to be free and also provides a secure way to hold on to the flowers. Maybe the dress you are wearing is sheer and flimsy and will not support the weight of flowers, so a traditional corsage is not possible. There is another option to consider - the handbag corsage. The handbag corsage also is for those wanting to carry flowers in an understated manner. This type of corsage is made to attach easily to your handbag with the help of strong magnets. There is no damage to your clothing or purse and the corsage is easy to remove. The corsage can be attached to either the handle or the main body of the bag and provides a surprising accent. Making a handbag corsage is simple. 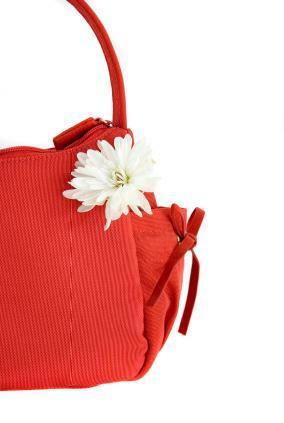 The first thing you will need is the bag you are planning to attach the corsage to. Be sure to take it with you when selecting flowers so that the colors will match one another. Next, choose the flowers you want to use for your corsage. Be sure to have wire, something to cut the wire with, glue, accents such as beads, lace and ribbon and either magnets or pins to attach the corsage to your handbag. You will need to cut all the stems of the flowers to the same length; 3-4 inches works best. Then you will insert wire below the head of each flower and secure all wire to one stem. Use accents to create a special look. Once all the flowers have been wired together and secured, the corsage can then be attached to your bag by pins or by magnets. Either one will need to be glued to the back of the corsage before attaching to your bag. A handbag corsage is the perfect way to carry flowers without worrying about the hassle of tying up your hands or wearing a corsage that may damage your clothes. Whether you design it personally or have it done by a florist, this type of arrangement is both beautiful and functional.